Nikola Pekovic and Kevin Love combined to shoot 10 for 36 and the Timberwolves failed to get over .500 on their seventh straight try. 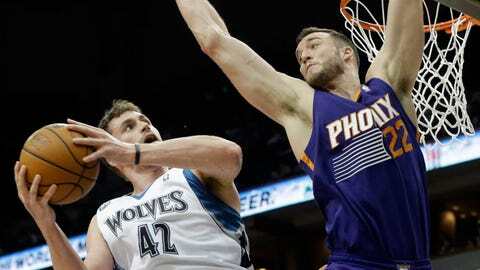 MINNEAPOLIS — Goran Dragic had 26 points, nine assists and six rebounds and Gerald Green’s baseline jumper with 3.9 seconds left lifted the Phoenix Suns to a stunning 104-103 victory over the Minnesota Timberwolves on Wednesday night. The Suns (21-13) trailed by six points with just over 90 seconds to play, but closed the game on a 7-0 run for maybe their most improbable win yet. Channing Frye scored 22 points and hit five 3-pointers and Green finished with 14 points for Phoenix, which was playing the second game of a back-to-back. Kevin Martin scored 20 points for the Wolves, but his runner at the buzzer clanked off the rim. Nikola Pekovic and Kevin Love combined to shoot 10 for 36 and the Timberwolves failed to get over .500 on their seventh straight try. The Wolves led 103-97 with 1:36 to play. But as usual in this unlikely season in Phoenix, the Suns never gave in. P.J. Tucker hit two free throws, Dragic scored off a steal, Markieff Morris hit another freebie and Green, the former Timberwolves flop hit a jumper with the shot clock winding down to seal it. The Wolves committed three turnovers in the final minute, the last on an errant pass from Ricky Rubio that gave the Suns the ball with 16 seconds to go. 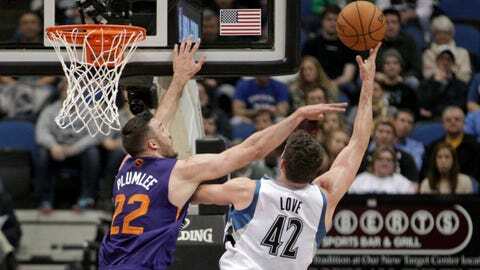 The Timberwolves shot 35 free throws to 23 for the Suns, but Corey Brewer and Rubio each missed one in the final 3:20 that ultimately proved costly. Love had 15 points on 4-for-20 shooting with 12 rebounds and Pekovic had 17 points on 6-for-16 shooting with 12 boards. Miles Plumlee had 11 points and nine boards before fouling out and Marcus Morris had 10 points and five boards for the Suns, who just keep surprising people. Two of the highest-revving offenses in the league had a hard time finishing plays for most of the night. Both teams hovered around 37 percent shooting for three quarters, missing from everywhere and anywhere, unless Frye was taking a 3 or Martin was uncorking that unconventional slingshot jumper of his. Martin had 20 points early in the third quarter and Brewer’s activity on defense and ability to get out in transition keyed a 30-19 period for the Wolves, who were rattled in the first 24 minutes by the Suns’ rugged defense and the way the game was being called. The first half was ragged, with both teams shooting under 38 percent and the officiating crew hearing complaints from all sides. The Suns took a six-point lead into the break thanks in large part on their ability to play through any perceived slights from the referee crew, while the Wolves came unglued. Love and coach Rick Adelman picked each picked up technical fouls for arguing with the officials, and the Timberwolves’ star missed 10 of his 12 shots in the first half. Pekovic didn’t fare much better, going 1 for 8 from the field and having all kinds of difficulty with Plumlee’s athleticism in the paint. Frye knocked down four 3-pointers, stretching the Timberwolves defense to its breaking point as he continued his feel-good comeback from missing last year because of an enlarged heart. His seamless transition back into the fold is just one of the reasons the Suns have been perhaps the biggest surprise in the league to this point. NOTES: Chase Budinger made his season debut for the Wolves after missing the first 34 games with an injured left knee. He got a big ovation when he entered in the first quarter and finished with six points in 11 minutes. … The Suns signed veteran G Leandro Barbosa to a 10-day contract on Wednesday. He didn’t take long to assimilate, shooting three times in his first minute on the floor. He finished with three points in 13 minutes.